In September 2006 we started working on a new project with BCMG, the Birmingham Contemporary Music Group, and the Austrian composer Johannes Maria Staud. BCMG have commissioned Johannes a new work for harpsichord, ensemble of nine instruments (flute, clarinet, bassoon, horn, trumpet, percussion, violin, viola and cello) and live electronics. 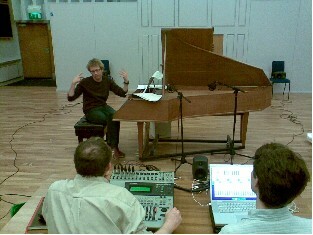 One Movement and Five Miniatures will be premiered in Birmingham on 22 April 2007, with Jonathan Green and Simon Hall performing the electronics. Under my supervision Jonathan Green has realised the live electronics part of the score using MaxMSP.